A Colorado Cub Scout has been kicked out of his den after asking a state senator tough questions about the current political landscape in America. Eleven-year-old Ames Mayfield said he was “heartbroken” after he was told he’d have to find a new den because he confronted state Sen. Vicki Marble over her stance on gun control. Lori Mayfield filmed a video of her son’s exchange with Marble, a Republican, at a Cub Scout event in Denver last week. In the video, the fifth grader confidently reads his typed questions while Marble listens. “Why on earth would you want someone who beats their wife to have access to a gun?” he asks. Lori Mayfield told 9 News that she knows critics will assume she was using her son to try to score political points, but insisted that the research and questions all came from Ames. In an e-mail to The Denver Post, Marble said she didn't take issue with Mayfield's questions. "I don't blame the boy for asking the questions, since I believe there was an element of manipulation involved, and it wasn't much different from the questions I normally field in other meetings," she said. 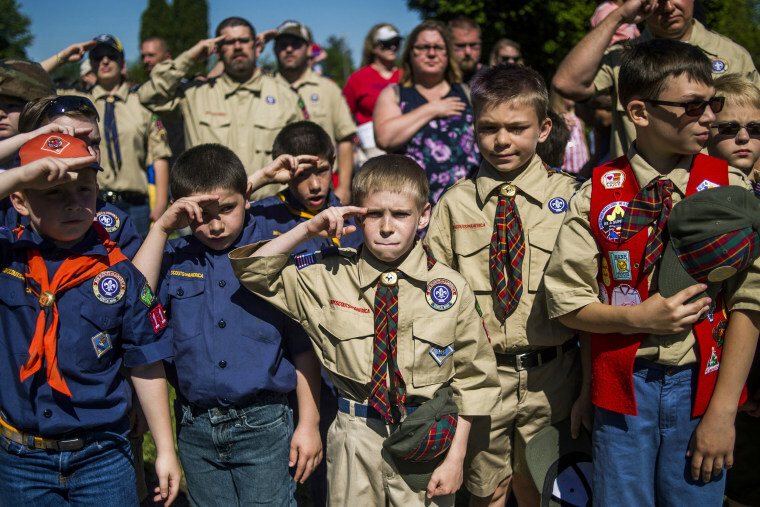 "The invitation to meet with the scouts was never intended to cause friction and controversy." Marble has not replied to NBC News' request for comment. Mayfield said the Scout's pack leader told her that her son would not be welcomed back into the den days after the exchange with the senator. She said the Scouts have offered to place him in other dens, but they don’t work with the family’s schedule. After the incident became public, Ames has received support on social media, including a tweet from Gabrielle Giffords, the former Arizona congresswoman, who praised his courage. “Ames, call me in 14 years. I’ll campaign for you,” she wrote. For his part, Ames said he isn’t sure he’d be interested in returning to the den after the incident. “I was a big fan of the den originally, but now since I know consequences and stuff and how they view things, I was concerned, so no," he said. "I don’t really want to get back in."